Love this chair !! It’s made to last a lifetime! 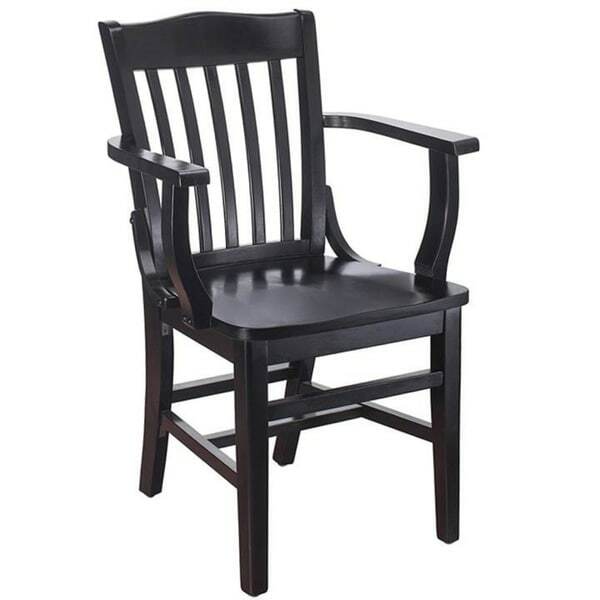 Add a classic touch to your home with the School House Arm Chair. This chair features a solid beech wood construction, and it comes in a variety of rich finishes to match your decor. Dimensions 25.0 In. X 18.0 In. X 38.0 In. Beautiful, sturdy and very comfortable! We bought this for my parents office and they loved the old school house charm. Excellent quality & value. These chairs come fully assembled in a box. Purchased six of them for our office conference table. Handsome, solid, and have received many compliments on the set! Very comfortable and nice looking chair. Made of solid wood. Solid piece of furnitire and good for back support. With a comfortable pad to sit on I am very comfortable in this chair. Highly recommend it for dining and playing card games. Definitely hard to sit on, but it’s what I wanted a sturdy solid chair. U just need to find nontoxic cushion seats for it now. This is a very nice chair. It’s a smaller size, sturdy, and perfect for several family members, who need chair arms to stand up. Well made. Arm rest make getting up much easier and faster.I'd recommend this chair for anyone that struggles getting up. Cute chair. Heavy, sturdy. Nicely finished. Purchased for extra seating. Seat is a little small. Good value for the money. This chair is very comfortable, even gives me enough arm room to stitch or knit without difficulty. Couldn’t be happier with this purchase. Sturdy, comfortable. The perfect piano teacher’s chair! "What is the weight limit on this chair?" "is this chair considered a counter top chair?" "What is the width from front leg to front leg? From the outside of the leg"
17 inches is the width from front leg to leg outside. "How high from the floor are the tops of the arms on this chair?" The measurement from the floor to the top of the arms is approximately 26.75 inches. Hello , the seat height is approximately 18 inches. Thanks for shopping with us! I needed a chair that was wide. This arm chair is listed as 24.5'' wide. I hope this is accurate.